Corduroy, boiled wool and tricot accessories. Too basic for you? Count on jewelry to bring a chic touch to the look. If you’re not one to give up color for the colder weather, our angora sweaters are just for you! 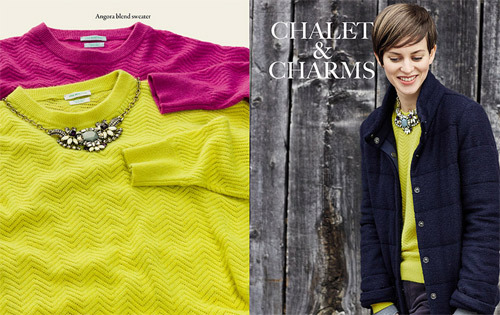 Neon yellow or shocking pink, perfect with a padded down jacket in night blue and stretch velvet pants. Seeking a touch of class? Look no further than gloves and a necklace with stones and crystals. Prefer to place your bet on pink shades? 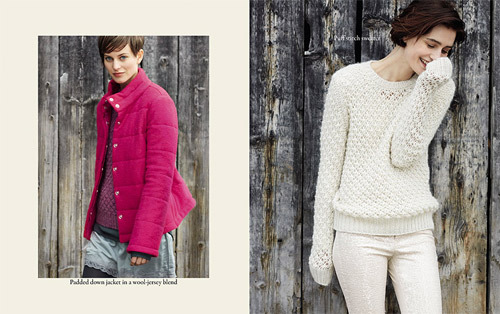 Choose the duvet padded jacket in fuchsia, a purple sweater and a pearl color skirt, made of satin and lace. A look designed with high class and good taste in mind. For women who want to feel like real snow queens, total white is the way to go. A soft white sweater with perforated workmanship and pants with tone on tone sequins. A combo that can light up even the grayest of days! Winter goes hand-in-hand with warm sweaters. 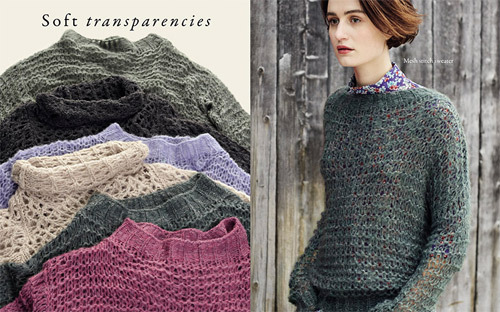 Explore the soft transparencies of puff stitch sweaters. Available in a wide range of colors, best when worn over a t-shirt or a floral print chiffon blouse and boyfriend jeans, for a casual appearance to flaunt at every opportunity. Our coats don’t miss a mark! Opt for a beige boiled wool coat, in a slightly oversized fit, and make it special by attaching a unique crystal flower brooch on the coat’s maxi collar. Together with a raglan sweater in mohair and lurex and cigarette-leg pants in gray needlecord, the effect is romantically glamorous! As for footwear? High-heeled half boots. Embellish an outfit with jewelry and accessories on that special occasion. Be enchanted by a popcorn knit scarf, a necklace with stones and crystals, rigid bracelets, a tricot bag with appliques, or a bobble cap and shiny details. Opt for the mix that suits your mood and get ready to shine!